Secondary metallurgy solutions from Primetals Technologies stands for fully integrated technology, mechanical engineering, automation and electrical engineering from a single source. These technologies are the basis for maximum plant availability, short charge-cycle times, low consumption values and top-quality treated steel. The result is high performance and productivity levels of both supplied and modernized plants combined with impressive cost savings in secondary metallurgy. From alloy handling to degassing, desulfurization and decarburization, secondary metallurgy is indispensable to the production of high-quality steel. All Primetals Technologies’ components are built to withstand the highest everyday loads. We achieve this through extensive standardization, many years of teamwork with selected suppliers, certified output controls and systematic quality assurance. The result: assured delivery times, high availability and a long plant lifecycle. 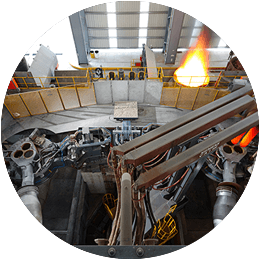 Installation of a ladle furnace between the melting and casting areas is vital to assure quality and productivity improvements in steelmaking. 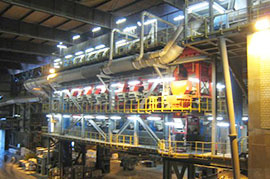 Ladle furnace arrangements include single stations (with fixed/swiveling gantries or with ladle cars/turrets) and also twin stations (two roofs) with one swiveling electrode gantry. The compact design guarantees minimum space requirement while offering easy access to the roof and for electrode replacement. During vacuum treatment the carbon, oxygen, nitrogen, hydrogen, and sulfur contents are reduced in different process steps depending on the melt composition. A vacuum alloy hopper system allows for compositional adjustments. Good homogenization and high alloy yields are characteristic features of this process. Depending on the metallurgical reactions in the ladle, a freeboard of 600–1,200 mm is required. In order to increase productivity, the VD system can also be designed as (or extended to) a twin-vessel system.The VOD system is a tank degassing unit which is additionally equipped with an oxygen blowing lance. This additional oxygen supply can be used for the production of extra-low carbon stainless steel grade (forced decarburization) or for chemical heating of the melt in conjunction with aluminum/silicon additions (VD-OB process). The vacuum pump is designed accordingly, having a higher capacity in order to cope with the increased offgas volume. The RH (Ruhrstahl Heraeus) process is carried out in a refractory-lined vessel, equipped with two snorkels which are immersed in the steel bath. By reducing the system pressure, the melt rises into the vacuum vessel where decarburization, degassing, and other degassing reactions take place. The injection of lift gas into one of the snorkels initiates a circulation process. Thereby, the whole heat is treated quickly. Immersion of the snorkels is either carried out by lowering the vacuum vessel or by lifting the ladle. In order to minimize vessel exchange time a quick-change vessel system can be provided. The VLD (Vacuum Ladle Degassing) represents the ideal solution for secondary metallurgical operations for small heat sizes ranging from 5 to 20 tons. The process was the result of a joint research and development project between Siemens Metals Technologies and Dörrenberg Edelstahl. All process steps which are possible in VD and VOD plants can be economically carried out with the VLD plant, even the production of special and stainless steel grades. 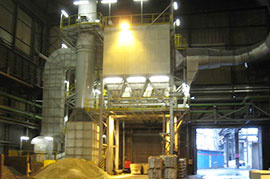 VLD plants are in operation worldwide, particularly in micromills, forging shops, and foundries. Meeting narrow tolerances and a fully automatic production sequence from steelmaking to casting is only possible with the support of highly sophisticated automation systems. Depending on steel grade and quality demands, our automation systems handle all types of process variants and operational procedures for ladle treatment facilities and furnaces, as well as vacuum degassing plants (RH, VD, VOD). 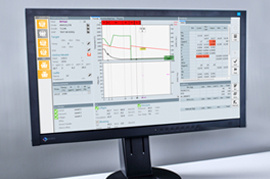 Beside the elementary functionalities, such as basic automation, heat tracking and operator guidance, the Steel Expert process model package features dynamic online optimization for consistent and flexible production. Steel Expert Prediction previews the theoretical course of the complete treatment, optimizes the scheduled treatment steps, and inserts additional actions to the treatment practice if required. The Steel Expert Supervision model cyclically determines the actual heat status. Actual process data as well as energy input, material addition and – if applicable – vacuum degassing parameters are taken into account in order to calculate the analysis and temperature of the steel bath and slag. For final adjustment of the steel the setpoint models calculate the required material addition and recommend the necessary measures for cooling or heating. To be successful in the steel market today, a producer must continually improve steel quality as well as productivity and reduce conversion costs. Continuous development in technology, equipment, and systems means that with relatively small investments, major improvements can be made in steel quality, plant performance, and production efficiency. Primetals Technologies offers a comprehensive range of tailor-made upgrading solutions for the harsh operating conditions of melt shops. All components and systems supplied are designed for endurance, easy access and low maintenance, and offer superb value for the money.